Successfully Added Cube iWork 8 Ultimate Dual-OS Tablet PC - Windows 10, Android 5.1, Quad-Core CPU, 2GB RAM, 3D Game Support, 8 Inch IPS Display to your Shopping Cart. The Cube iWork 8 Ultimate is the perfect tablet PC for anybody out there that simply can not choose on whether to purchase an Android or Windows tablet PC. As a Dual-OS tablet, this remarkable device packs all the benefits offered by both Windows 10 and Android 5.1 – allowing you to enjoy all features of a Windows and Android tablet PC simultaneously while using merely one device. Windows 10 brings along great efficiency with its Office programs, making it perfect for study and business purposes whereas Android comes packed with the latest applications and mobile game opportunities – making this Dual-OS tablet computer suitable for anybody out there. Whether you’re looking for an affordable tablet for your study, business, or entertainment – the Cube iWork 8 Ultimate is guaranteed to meet your demands. For the mobile entertainment and gaming lovers among us, this high-end tablet computer is a must have. Coming with 3D game support, you will be able to enjoy the latest 3D games the industry has to offer. Its Intel HD Graphic (8gen) delivers absolutely stunning detail – letting you play the most graphically demanding games without dropping a frame. 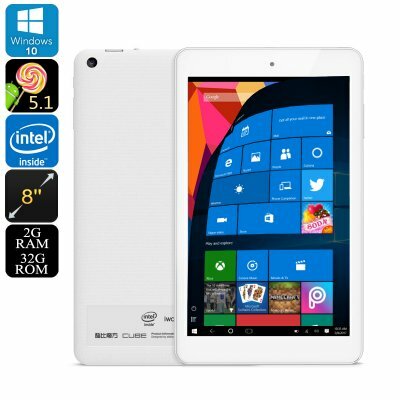 Added to that, this affordable two in one Windows and Android tablet PC packs a powerful Quad-Core CPU and 2GB RAM that together deliver plenty of power to tackle the most demanding of programs, apps, games, and multitasking sessions. Further increasing your overall user experience is OTG support that lets you attach external hardware such as a keyboard or gamepad to your tablet as well as its HDMI out support that lets you enjoy all features this tablet has to offer on your big screen TV or PC monitor. On its stunning 8 Inch IPS display, this Dual-OS tablet computer portraits breathtaking visuals in vivid color. With its 1280x800 (WUXGA) resolution, you can be guaranteed to experience a first-class mobile experience. Packing 32GB of internal storage and supporting up to 64GB of external memory, you can be assured that the Cube iWork 8 Ultimate always holds enough space for you to store all your files and media alike. Additionally, this tablet computer features a massive 3300mAh battery that brings along enough juice to get you through numerous hours of continuous usage time – letting you enjoy movies, games, along with all its other features throughout the day without needing to worry about battery life. For all the selfie lovers out there and for the people that like to engage in online video calls, this tablet PC packs a 2MP front snapper as well as a 2MP rear camera. Although it comes with an affordable price tag, the Cube iWork 8 Ultimate packs the latest hardware and software alike – making it truly a cheap tablet PC that offers great value for money compared to competitive devices. Whether you use it for study, watching movies, gaming, or simply like to browse the web – this tablet PC will not let you down. The Cube iWork 8 Ultimate comes with a 12 months warranty, brought to you by the leader in electronic devices as well as wholesale electronic gadgets..
Arabic: - 8 بوصة الكمبيوتر اللوحي - Chinese Simplified: - 8 英寸平板电脑 - Czech: - 8 palcový Tablet PC - Danish: - 8 tommer Tablet PC - Dutch: - 8 inch Tablet PC - French: - 8 pouces Tablet PC - German: - 8-Zoll-Tablet-PC - Hebrew: - 8 אינטש Tablet PC - Hindi: - 8 इंच गोली पीसी - Italian: - 8 pollici Tablet PC - Japanese: - 8 インチ タブレット PC - Korean: - 8 인치 태블릿 PC - Malay: - 8 inci Tablet PC - Norwegian Bokmål: - 8 tommer Tablet PC - Romanian: - 8 inch Tablet PC - Russian: - 8-дюймовый планшетный ПК - Spanish: - Tablet PC 8 pulgadas - Thai: - 8 นิ้วแท็บเล็ตพีซี - Turkish: - 8 inç Tablet PC - Vietnamese: - 8 inch Tablet PC.